The sixth largest lake in the world is located deep in the continent of Antarctica where it has been isolated under two and a half miles of solid ice for more than 14 million years…and, according to the Wired Science blog, it will remain so for at least one year more. A team of Russian scientists that has been drilling through the ice was scheduled to break through this month, but extreme weather has required them to leave the site until next December. So what’s in the water? What lies beneath the mammoth sheet of ice may provide answers to what Earth was like before the Ice Age and how life has evolved. 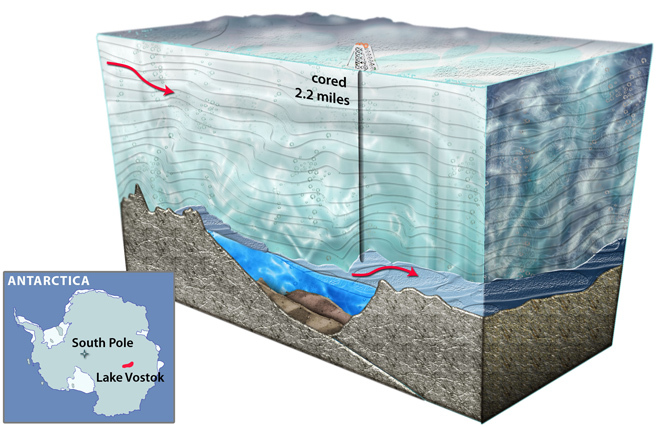 Most importantly, Lake Vostok appears to be incredibly similar to the frozen lakes of Jupiter’s Europa satellite and Saturn’s Enceladus. As Wired UK reported earlier this week, NASA and the ESA have already planned a mission to esplora Europa’s lake in 2020. If life is found in Vostok, the implications for the possibility of extraterrestrial life on Europa and Enceladus are huge. One thing that some people hope they don’t find is kerosene (or Shoggoths, for that matter), the substance with which the team has filled their unfinished bore-hole to prevent it from icing over.